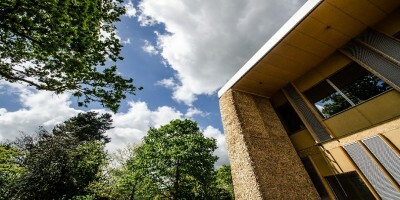 The Enterprise Centre, University of East Anglia in Norwich, was created as a flagship low carbon building design, meeting the highest standards for energy use and sustainability – and aims to be Europe's lowest carbon commercial building. 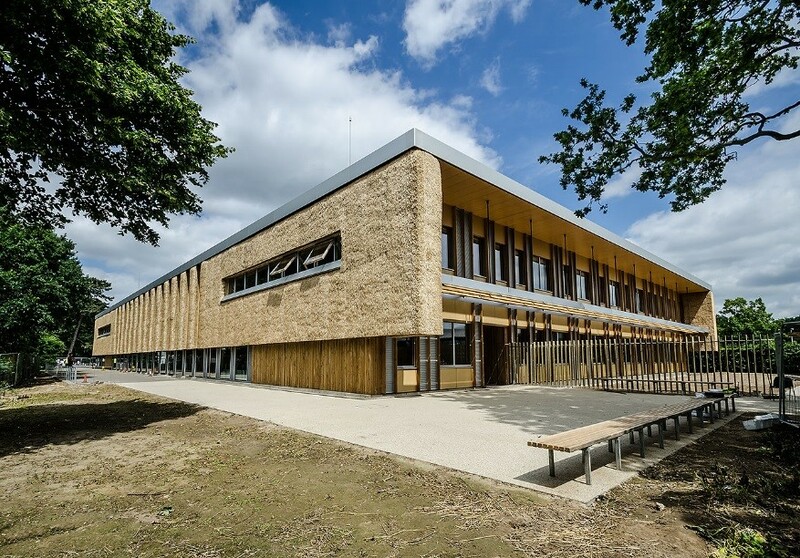 The Enterprise Centre achieved record-breaking sustainability credentials for a building of its kind by achieving both BREEAM Outstanding and Passivhaus accreditation. Morgan Sindall plc, Single Point Deliverer for the project, installed a thatched cladding system – the first time a thatch cassette cladding system has been used anywhere in the world. Delta-Simons worked collaboratively with Morgan Sindall, designers, engineers and project teams to assist in the development. With the demolition of the original concrete floor slab structures, we advised Morgan Sindall on the crushing of the concrete to the highest specification for reuse on site in accordance with the waste hierarchy. This required geotechnical analysis including frost-susceptibility. The lifting and crushing of the former floor slabs was monitored by our team and a carbon footprint of these operations, including the mobilisation of a plant to be on site, was calculated. The carbon emissions were then mitigated by 200% through a mixture of carbon neutral, company-verified, international off-set schemes and the UK Woodland Trust's "Woodland Carbon", effectively making these operations "Beyond Carbon Neutral". The material recovered was reused in the project, with significant cost and carbon savings as a result of eliminating the need for increased transport to impart suitable material, and avoiding use of additional new materials. Phase I and Phase II geoenvironmental ground investigations, including cone penetrometer testing, had identified uncertainty regarding dissolution features in the geology, contamination and flood risk issues. The accuracy of the ground investigations was absolutely vital to the design of the building structure, and the outcome of the investigations had far reaching consequences for the design. Originally the building was to have a timber ground floor, with the structural timber frame of the building passing through the timber floor and supported on very small independent concrete pad foundations, all designed to limit the use of concrete which is very high in embodied carbon. The discovery of multiple dissolution features, together with evidence of a glacial river bed, immediately made this design concept unworkable and redundant. Instead the timber floor had to be changed to a heavily-reinforced, high specification concrete raft foundation that would span the dissolution features, and yet still meet the low carbon target for the project. This was achieved using specially designed unique concrete mixes. The reliability of the ground investigations, together with the swift manner in which they were conducted, meant that the results were rapidly made available. Together with a collaborative working approach with Morgan Sindall' s designers it ensured that this significant change to the building design was immediately accommodated for, and that the project wasn't jeopardised. The project also demanded surface water discharge to land as the site's location had no suitable existing surface water drainage infrastructure, and no funds or window of opportunity to install any. Shallow soakaways in close proximity to the building were not feasible due to unstable geology as a result of the dissolution features. Added to these issues was the site's location over a principal aquifer that supplies the drinking water to Norwich so that very stringent conditions imposed by the Environment Agency in relation to surface water drainage and soakage had to be complied with in order that the EA's initial objection to the planning consent could be discharged. Our team provided innovation, risk assessment and geotechnical services that enabled design of deep borehole soakaways discharging beneath the dissolution zone into the structured chalk, including technical liaison with the engineering designers and the Environment Agency. We then installed the soakaways which were proof tested by a 40-tonne water tanker equipped with a flow meter to function at design flow rates. As a further complication to an already difficult site from a geological perspective, an unacceptable level of ground gas was found to be present. This was due to large volumes of organic waste having been deposited on the brownfield site during its previous use as a local council mulching yard. Our team carried out a comprehensive ground gas investigation to monitor gas levels before, during and after removal of the mulch. This demonstrated and certified that following the removal of the mulch that no gas membranes were required to be incorporated into the raft foundation design, thus making substantial project savings both financially and in embodied carbon. We also advised on disposal of the organic waste in the most economical fashion. During the construction, Morgan Sindall stockpiled foundation excavations originating from the construction of the development. UEA then instructed our contaminated land team to carry out chemical analysis of this soil in order for the landfill operators to make an informed decision about whether they could accept the waste for removal. The environmental credentials of the project were established at demolition stage and we recognised the commitment of the Morgan Sindall team to shared environmental targets of the highest standards. Our geographical knowledge of the site identified that a review of the original ground floor design was needed. This enabled the design team to ensure that the drainage issues were identified and solutions put in place, and that low carbon concrete mix could be used to safeguard sustainability. Difficult and potentially critical planning/construction conflicts were resolved through a combination of team innovation, understanding of the ground and a common sense approach to sustainability. "Without doubt the core objectives of this project, i.e. low carbon, highly-sustainable buildings, have been easily and thoroughly understood because of the extensive involvement of Delta-Simons from a very early stage in the project, and throughout much of the construction period. "Solving the unique multi-faceted equation of difficult geology, surface water discharge restrictions, low carbon construction and a very tight budget could have been at least very disruptive to the project, and at worst could have prevented the project from being completed. This was accomplished far more easily due to the collaborative, flexible, innovative and always attentive involvement of Delta-Simons. I look forward to involving Delta-Simons in all future projects with a need for geological investigation, management of potential waste and compliance with Environmental bodies."